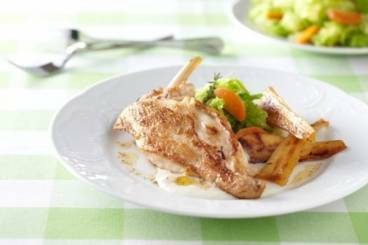 Usually eaten during the winter, parsnips are a root vegetable belonging to the same family as the carrot. This vegetable has a mild, sweet flavour and is best enjoyed when roasted, mashed or thinly sliced and fried to make crisps. Crisp fillet of sea bass served with parsnip purée and a grape, chestnut and red radish dressing. 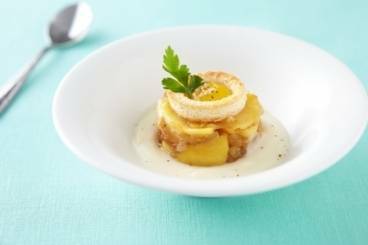 An autumnal soup of lightly spiced parsnips finished with a chive oil. 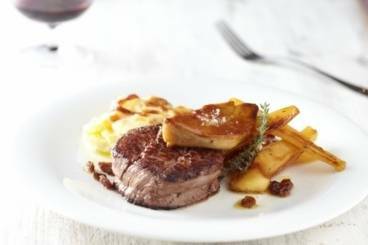 Roasted fillet steak with a creamy horseradish flavoured potato gratin with honeyed parsnips and seared foie gras. Roasted pheasant breast with Savoy cabbage, honey glazed parsnips, bread sauce and beurre noisette. Steamed salmon steak with a snail, parsley, caper and crouton garnish served with a winter vegetable purée of parsnip, Jerusalem artichoke and chervil root. Roasted deer steak and foie gras served with crushed chervil, parsnip and Jerusalem artichokes and a redcurrant, red wine and pepper sauce. Crostini of quail's egg served with parsnip puree and confit onion and apple.